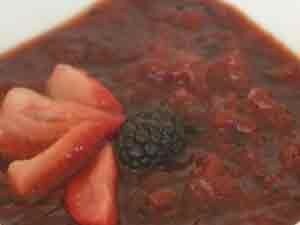 Dry Fruits And Strawberry Chutney recipe by Nazia Nazar at PakiRecipes.com. A spicy-sweet-sour condiment made with fresh and dried fruit. Heat butter in a pan and add cardamoms, whole cloves and cinnamon . Add chopped dry fruits and saute for a few minutes. Add sugar and lemon juice. Mix. Add a little water so the sugar does not caramalise too much. Let it boil. Add raisins , cashew nuts and almonds . Add lemon rind and sliced orange peel. Mix. Add a little honey (3-4 tablespoons) and mix. Serve hot or cold.